Location, location, location. In some books, the sense of place becomes its own character. The location provides a meaning and impact all its own, contributing to the actions of the characters as well as the readers’ understanding of them. Kitchens of the Great Midwest is one such book. The first giveaway, of course, is the title. Our first program and panel discussion on Thursday, February 4th is on The Upper Midwest and its Scandinavian Influences. Two sociologists and a historian, all with Midwestern or Swedish roots, will discuss the Midwest as a place and theme in our novel. Keep in mind also that J. Ryan is himself a Midwestern native. What do we mean when we say, “The Midwest?” We all know what we mean…or do we? There is no strict definition, something our panelists can surely comment on. The map included here are the results of a poll, and you can see the range of response. This map includes Colorado! Are we Midwestern? For the record, most “maps” don’t seem to include us. 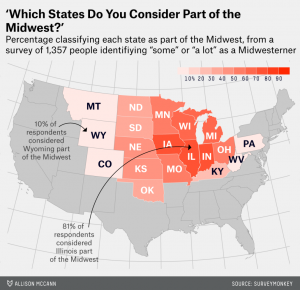 Here’s one article which describes 12 different maps of the “Midwest“, all with unique perspectives and varying results. The language and accent of the region, too, well defined for us culturally by films like Fargo (showing February 14th), are unique. Business Insider’s article, 12 Midwestern sayings that the rest of America Can’t Understand, is worth the read for a few chuckles. So, are we looking forward to the first One Book program? You betcha!